I realize that it’s the time of the year when we all want some figgy pudding or fudge or hot chocolate,, or (name your favorite) but honestly, a delicious low fat lemon, blueberry pound cake recipe sounds just about perfect right now. The last few weeks, I’ve been indulging in a few too many rich foods, and I decided it was time to bring out one of my favorites. A friend shared this with me around 15 years ago, long before I had a computer, and it always brings back such fun memories of my young mom days. It’s something how a recipe can do that, isn’t it? With a hint of lemon accenting the blueberries, mixed in with some low fat options, it’s a cake that allows me a bit more sweet treat indulgences on a second piece. And honestly, isn’t any time of year, the perfect time for some Pound Cake? 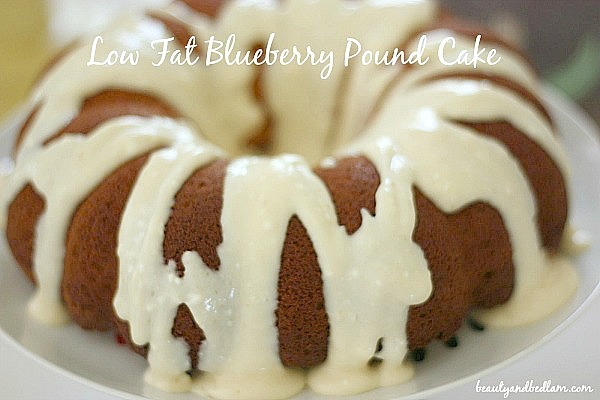 Low Fat Blueberry Pound Cake – let’s all take a moment and wish we had a piece in front of us right this moment. If you are in need of some more Simple Holiday Recipes, have fun browsing here. Summary: With a hint of lemon, this deliciously moist pound cake bursts with blueberries. The low fat alternatives allow me to indulge in a second piece. Beat first three ingredients together at medium speed of a mixer until well blended (about five minutes). Add eggs and egg white, one at a time, beating well after each addition. Lightly spoon flour into dry measuring cups and level with knife. Combine two tablespoons of flour and blueberries in a small bowl and toss well. Combine remaining flour, baking soda, baking powder, and salt. Add flour mixture to sugar mixture alternately with yogurt, beginning and ending with flour mixture. Fold into blueberry mixture and vanilla. Pour cake batter into a ten inch tube pan coated with cooking spray. Bake at 350 for one hour and ten minutes or until wooden pick inserted in center comes out clean. Cool cake in pan for ten minutes: remove from pan. Glaze – Combine powdered sugar and lemon juice in a small bowl; drizzle over warm cake. Cut with serrated knife and serve warm. So yummy!